SynthoTec Ltd is widely regarded as the UK market leader in the field of manufacturing high precision plastic bearing cages. The company originated in the early 1970’s when it was the in-house injection moulding department of a major UK bearing manufacturer. Following a change of ownership in 1990, SynthoTec continued to grow and consolidate its progress, developing its market position in both Western and Central Europe. The company’s continuing success is illustrated by the development of a second manufacturing plant in Zilina, North Slovakia, in 2006/2007. With the majority of its impressive output sold within Europe, the company’s development strategy continues to focus on a very high level of technical expertise within a low cost structure, targeted towards selected customers and specific industries. SynthoTec believes in establishing an in-depth understanding of customers’ specific requirements, while consistently delivering the highest possible quality of product at the lowest possible price. The company has proved that by working closely with its customers over extended time periods, coupled with examining manufacturing production cycle and out-of-cycle costs, it can achieve realistic unit price reductions without compromising product quality. SynthoTec's recognised ability to develop advanced production processes, including the precise design of moulds, enables the manufacture of high volumes of products to very accurate dimensional tolerances at relatively low cost. Although this expertise has been developed to meet the demanding requirements of plastic bearing cages, the company’s skills have also been applied to other products with similar challenging requirements. SynthoTec’s hi-tech injection moulding machinery and ancillary equipment is specified to meet demanding requirements. The company’s injection moulding machines range from 40 tonnes to 90 tonnes clamp force and can accurately deliver from below 1 gram part weight up to approximately 120g. In accordance with SynthoTec’s high component quality, price-down philosophy, machines are fitted with specialist robot component removal and storage facilities. The ISO 9001:2008 accredited company operates stringent quality control standards, with all production staff having responsibility for the quality of their own work. Standard quality control procedures are based on rigorous automotive industry requirements, while all new projects are planned by APQP, whilst initial sampling is applied in accordance to PPAP. To ensure the continuing quality of its output, SynthoTec makes regular investments in the most up-to-date quality control equipment. 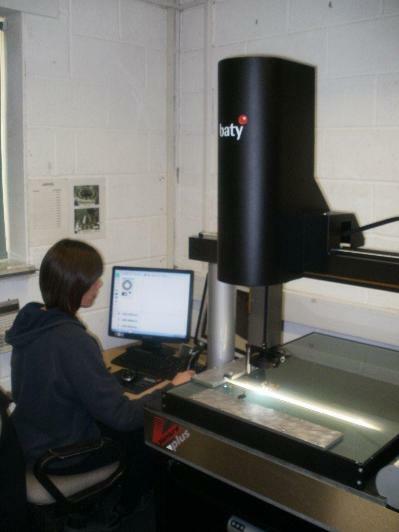 After searching for an extremely accurate vision measuring system capable of keeping pace with the high throughput of precise work processed by the company’s busy Quality Control Department, Clive Sharpe, SynthoTec’s Quality Manager, has purchased an advanced Venture Plus machine from Baty International. “Because of the deformable character of many of our high-volume range of parts, normal physical measuring techniques could lead to errors in our gauging routines. This meant that our proposed new measuring device had to have highly accurate, non-contact characteristics, and also the ability to handle a large throughput of very precise work. When I’d explored the available options I organised several demonstrations of potentially suitable non-contact measuring machines. Although I was impressed by aspects of all the alternatives, the Venture Plus Vision System from Baty met - and in many ways exceeded - all our criteria. Venture Plus utilises an all aluminium bridge type construction, resulting in both low inertia and reduced thermal mass. Air bearings are used on all axes, whilst a granite Y beam is used for increased accuracy. This ensures that the machine will expand and contract uniformly with temperature changes, resulting in minimal distortion and errors. Ambient temperature can be compensated for within the Fusion software making Venture Plus ideal for use on the shop floor. Advanced Venture Plus features include patented light table technology, segmented LED lighting, high resolution 0.5μm scales for increased accuracy, scanning & best fit features, autofocus, Renishaw TP20 touch probe joint and integral zoom optics. Whilst Baty’s easy to use software includes advanced teach and repeat programming, CAD import / export, fully dimensioned part view, one click output to Excel™ and an SPC facility.